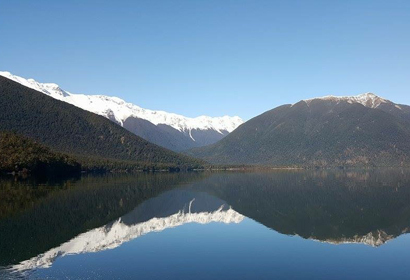 Lake Rotoroa, situated in the heart of the Nelson Lakes National Park, is surrounded by pristine and rugged natural beauty. Perched within the Park, at 1,200 meters and sacred to the Maori, is Blue Lake which contains the clearest natural fresh water in the world. When you arrive at Lake Rotoroa, you will discover a handful of permanent residents, no shops, street lights or phone reception, abundant fresh water, fresh air, fish and birds, unpolluted night sky and an amenity block. We are the only service provider offering a water taxi service to take you to the far side of the lake where wilderness tracks commence and link to overnight huts, Blue Lake and other natural beauties. We also provide accommodation at Lake Rotoroa and guided fishing and hunting expeditions, by appointment. Just ring us on +64.35239199 to organise your wilderness adventure. The water taxi introduces you to the untouched natural expanse of crystal clear lake water and one of the finest uncluttered views of the National Park. The taxi trip takes twenty minutes one way and you board and depart by jetty so that your feet and gear remain dry. We pick you up on the day/time agreed at time of booking. At the other end of the lake you connect to professionally graded tracks and huts maintained by the Department of Conservation. The tracks introduce you to majestic mountains, perched lakes, waterfalls, gorges,wildlife and stunning flora and fauna. For more information, click our hiking tag. 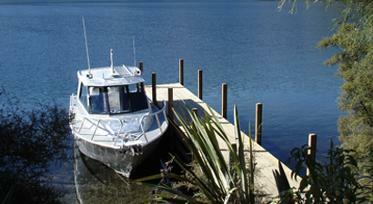 Our water taxi drivers are licenced by Maritime New Zealand. The boat is licenced to carry twelve people and gear and is fully equipped for everyone's safety and comfort.